Our groves are located within the Biosphere Reserve of Lands of the Ebro River, so declared by UNESCO. This space aims to promote the sustainable use of natural resources and the conservation and protection of biodiversity. We are located between the towns of Horta de Sant Joan and Caseres, in the region of Terra Alta, Province of Tarragona. Separated from Ebro Valley by the Natural Park “Els Ports” and Montsagre mountain, which determines a particular climate and geology and influences the singularity and quality of our olives and oils. The dry Mediterranean climate, and an altitude of five hundred meters above sea level give us the ideal environment for a harmonious maturation, necessary to obtain the best quality olive. 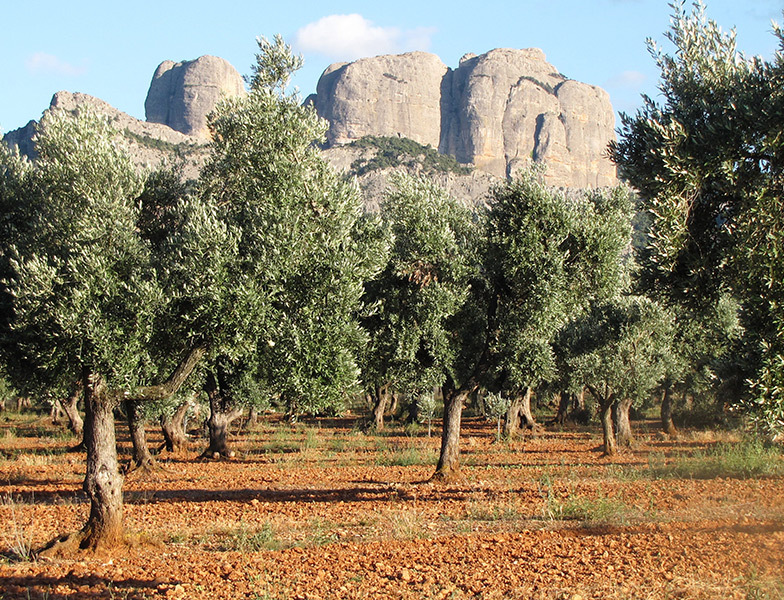 A thin layer of alkaline soil on a bed of limestone rock that emerges in many parts of the groves, influences our trees to produce olives of these unique characteristics. All this creates the ideal conditions for the development of an olive oil of extraordinary quality and sensory virtues, and differentiated from other oils made with the same olive varieties. The environment in which we stand is a high landscape and has transcended to the world thanks to the presence of Picasso who was inspired by the particular shape of our town for some paintings of his Cubist’s period as "La Barca", "Casas en la Colina" and "El Pantano", among others.